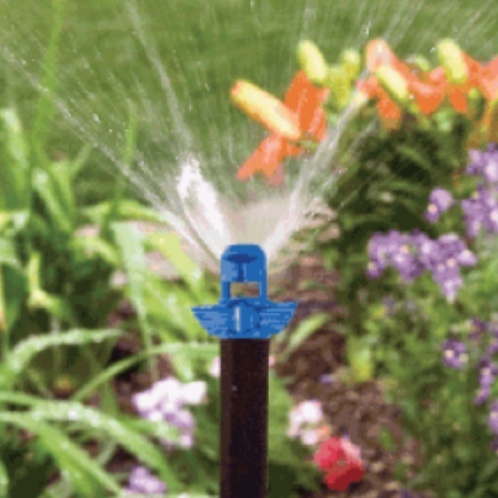 The DIG 12” Pop-Up Micro Spray Jet has a barbed elbow inlet on the bottom and is available with 90º (blue), 180º (green), or 360º (red) threaded micro-sprayer head for use above a flowerbed or any low landscape planting. The assembly's shaft rises up 9" - 10" above the ground when system is turned on and pressurized. Main assembly body should be placed below grade so pop-up retracts when not in use to provide a clean, aesthetic look. The barbed inlet makes it easy to use a short section of micro-tubing to connect to your mainline or would even allow for direct connection to the mainline if it is buried. 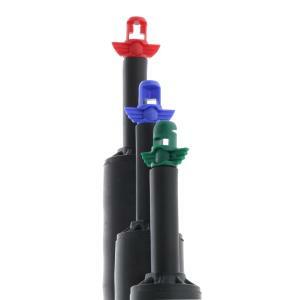 Use these pop-up micro sprayers for groundcover, flowerbeds and shrubs or where conventional sprinkler systems or drip irrigation would not be practical and the drip tubing needs to be covered. Durable polypropylene body and piston with EPDM and vinyl seals and stainless steel spring providing long life.